This page is for informational purposes only and none of the figure specimens are available for sale. 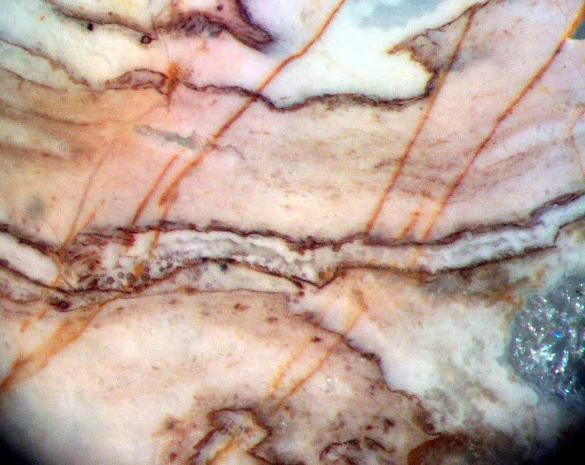 Links to our pages containing Rhynie Chert thin sections that can be purchased are shown below. 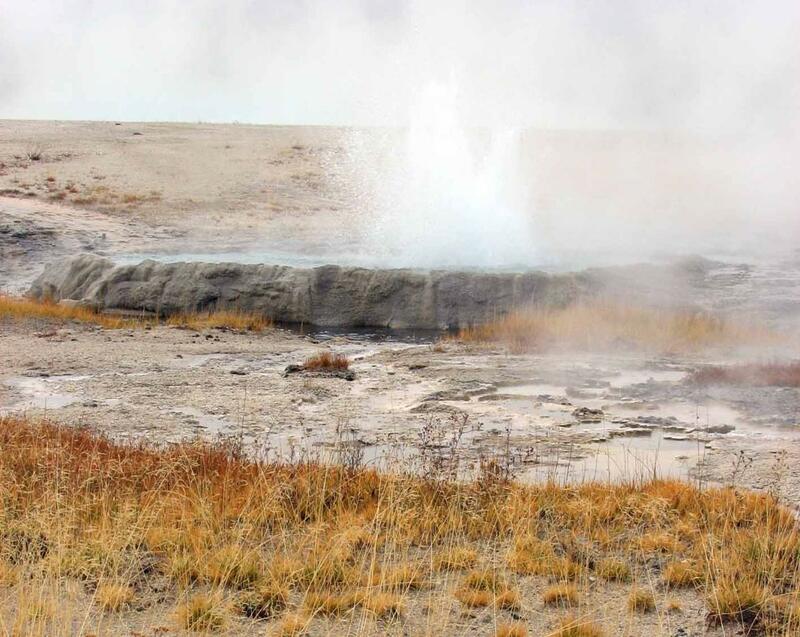 the ponds created by such geysers that the Rhynie Chert fauna and flora lived. 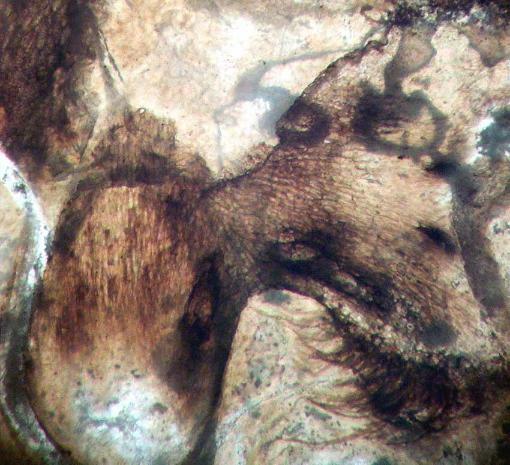 insects that crawled and hopped between the plants have been 3 dimensionally preserved in the chert. outcrop naturally at the surface, instead it is glacial float blocks that have to be collected. specimens we can generally offer for sale. known of the Rhynie plants. 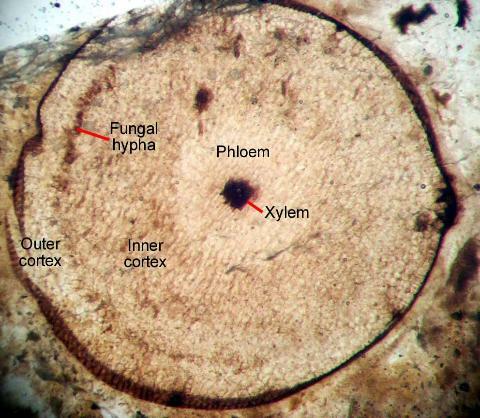 of fungal hypha that lived within the cortex of the plant. 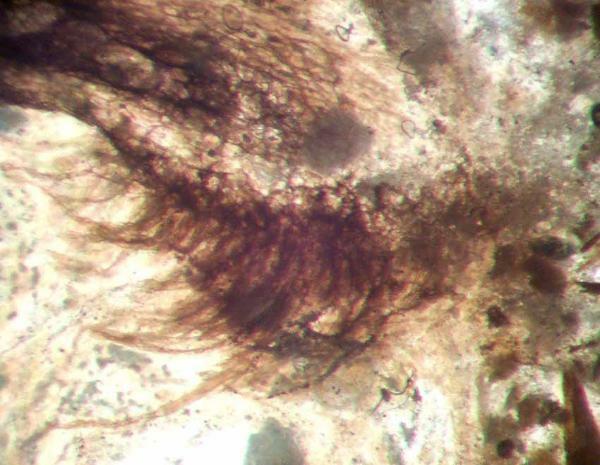 axis but can bear rhizoids on the ventral sides. 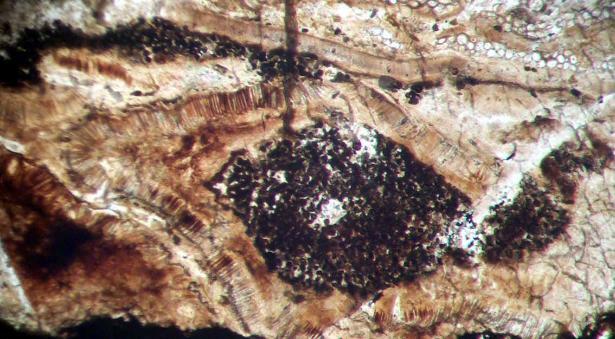 layer and white mass of the inner layer. 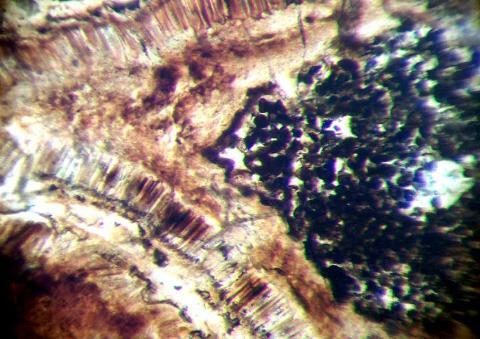 An additonal example of a near complete Aglaophyton major sporangia with spores. 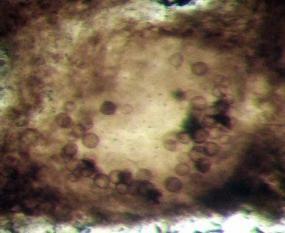 The elongate cells of the outer layer are again evident in the image (right). 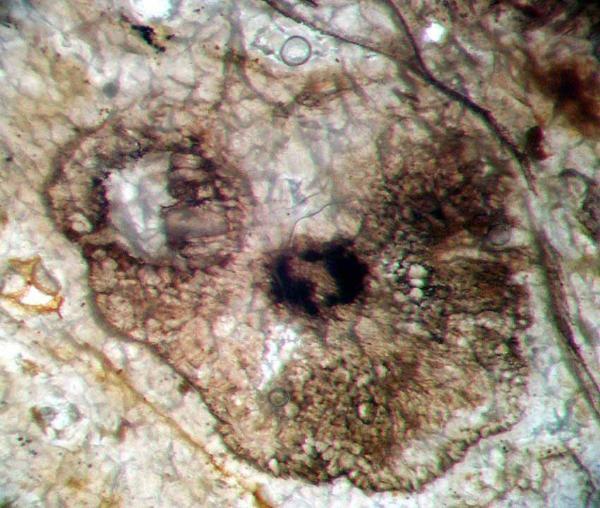 Left: An example of an Aglaophyton major aerial axis that has begun to decay (evidenced by the voids). Right: Another axis in a more advanced state of decay. 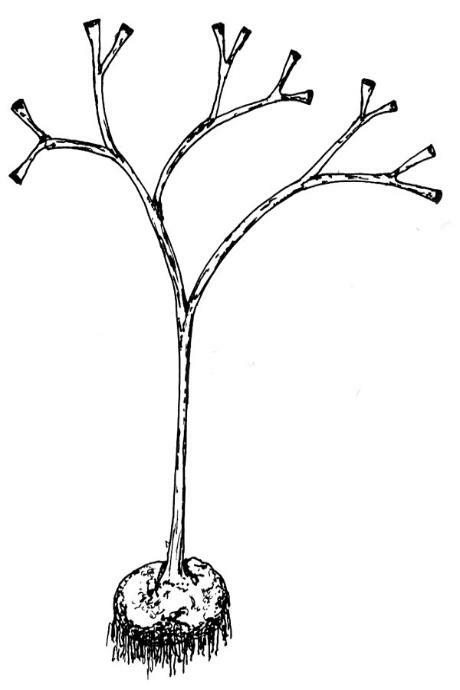 axes branched off the rhizomes and grew to a height of 15 to 20 cm. 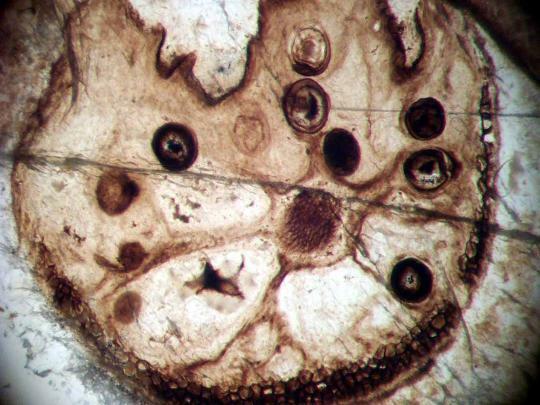 Kidney shaped sporangia were present on the tips of the fertile axes. 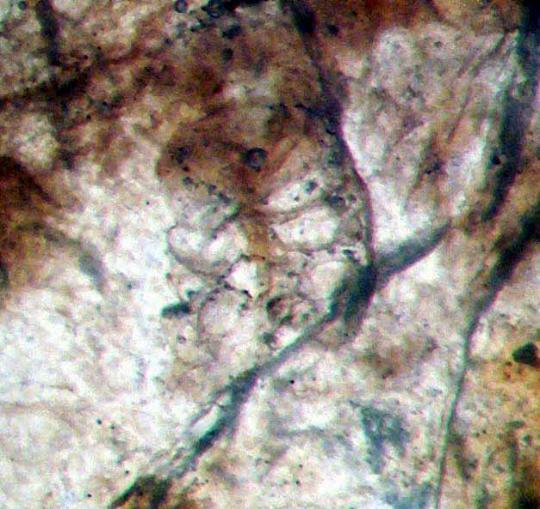 throughout the epidermis and is constant throughout the aerial axes. believed to represent the dichotomy of the aerial axes. 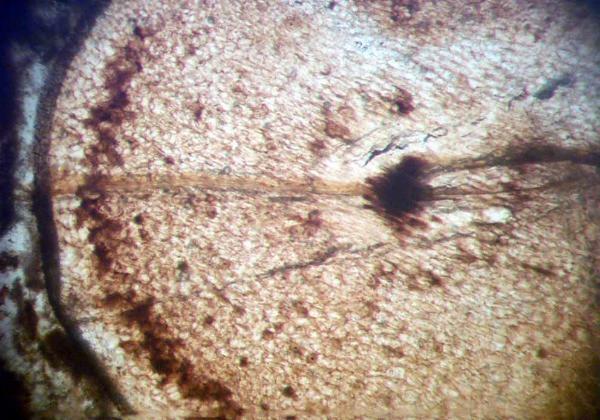 Left: The axes of Nothia showing very little differentiation and no cell structure to the cortex. 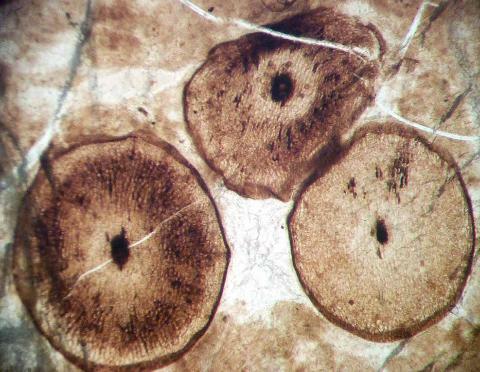 Right: the double xylem typical of Nothia. 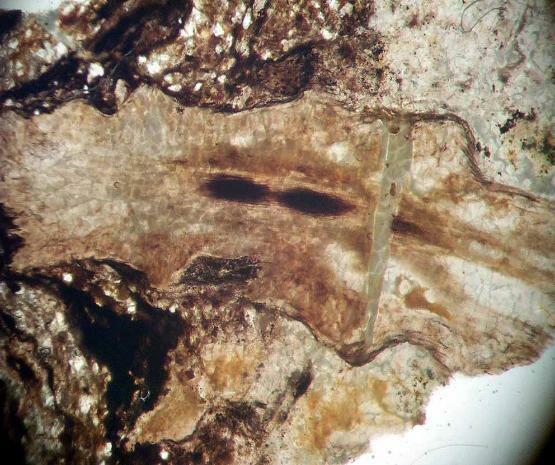 Again the specimen shows little differentiation of the cortex. present and consists of small, dark walled cells. 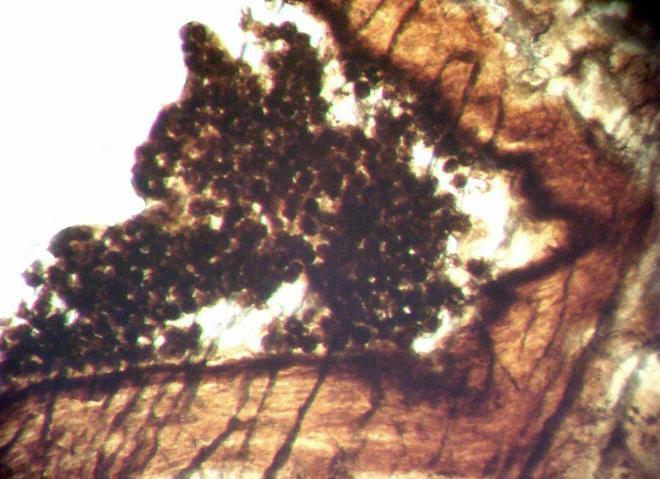 The sporangia of Horneophyton appear at the tips of the aerial axes. 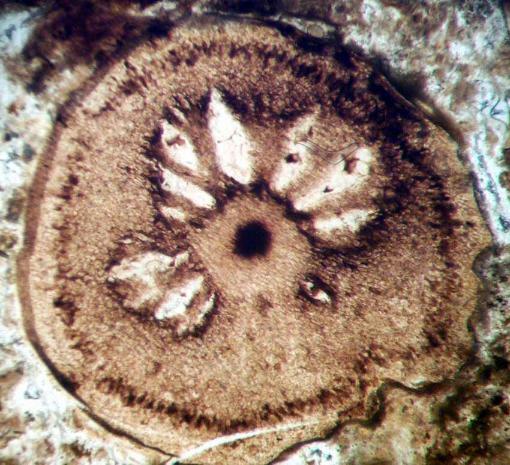 Left: The multilobed root ball of Horneophyton. 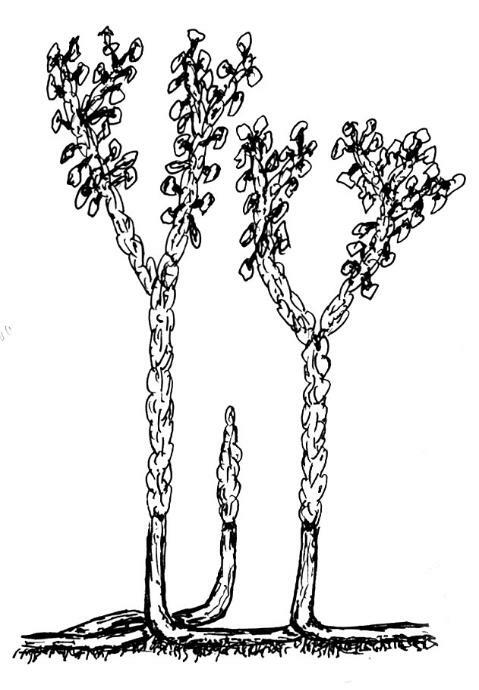 Right: An enlargement of one of the large rhizoidal tufts. 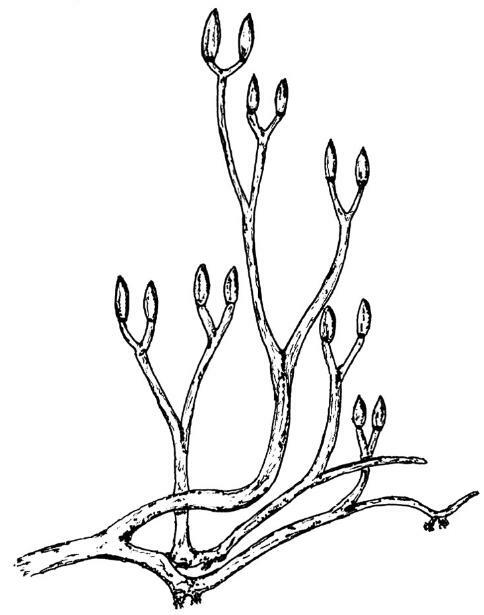 Left: Sketch of Horneophyton sporangia. 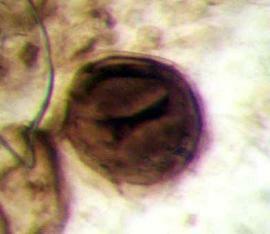 Right: An enlargement of a cup shaped sporangia with spores. 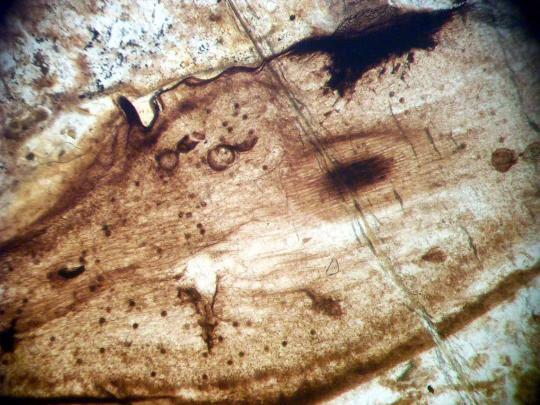 measures ~100 microns (0.1mm) wide. 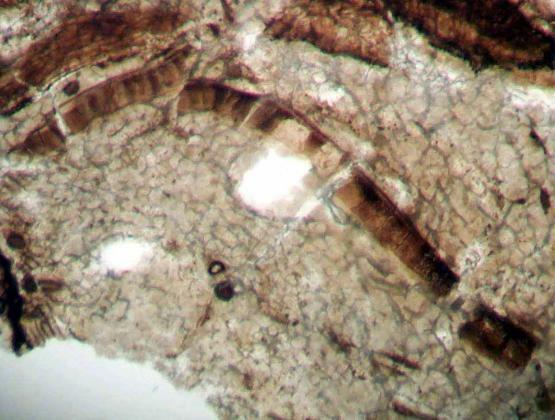 measuring only ~30 microns (0.03 mm) wide. 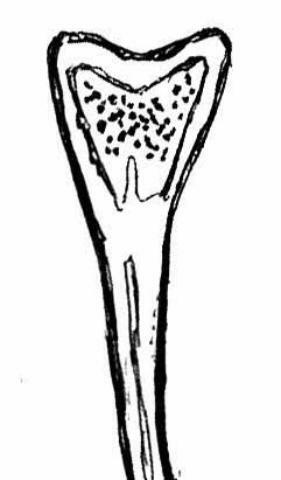 their cavities abundant specimens of the smaller forms. 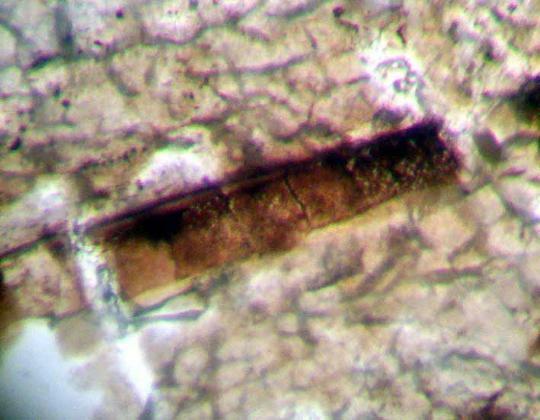 higher plants where the fungi lived in symbiosis with the host. 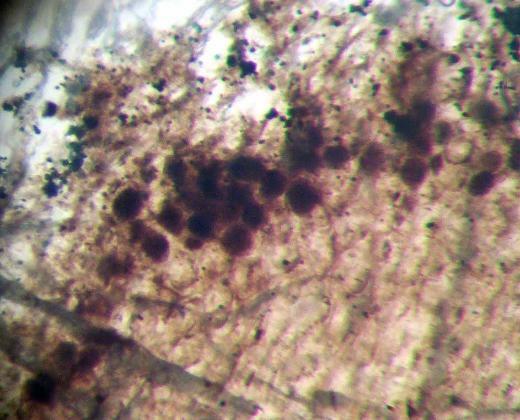 axis is formed by the presence of fungal hypha. 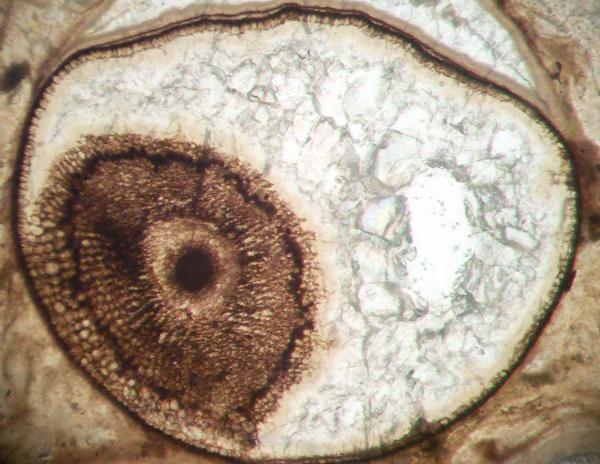 Above left: An axis of Aglaophyton containing the dark ring formed by Glomites rhyniensis. Right: enlargement of the Glomites hypha. 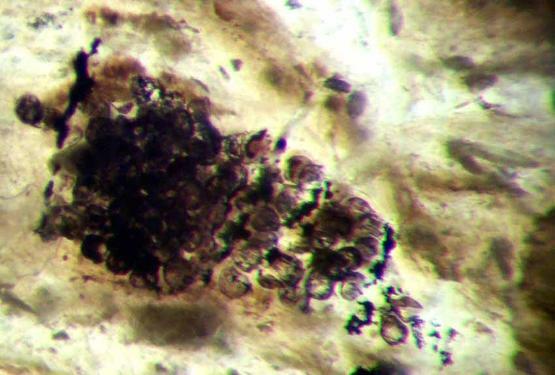 are made up of the spores of plants. 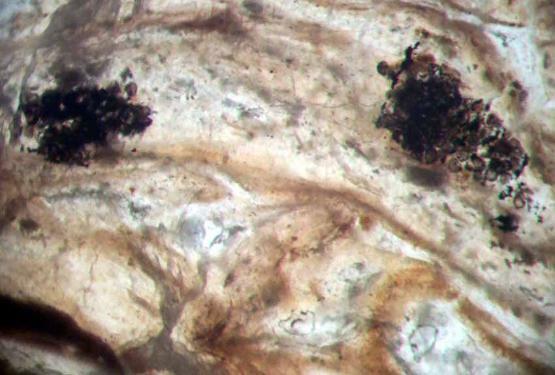 Above left: A pair of arthropod coprolites made up of digested spores. 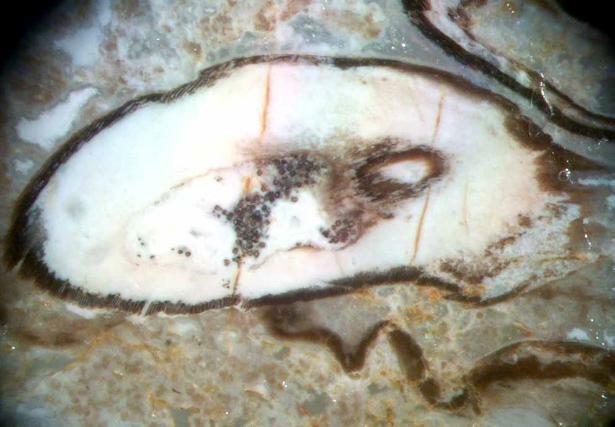 Right an enlargement of an arthropod coprolite. 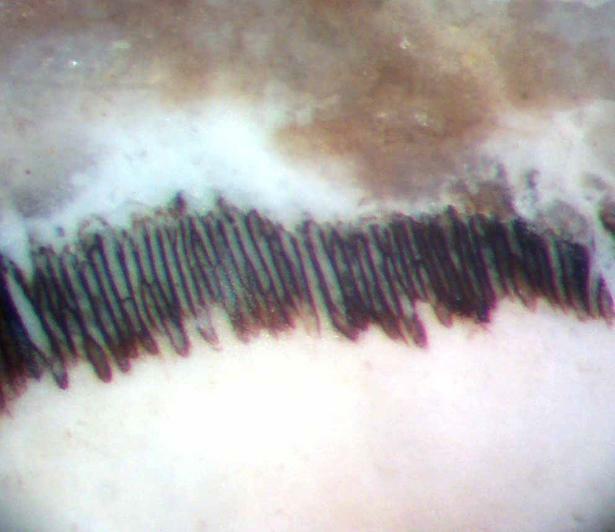 Left: Another sign of arthropod activity - this axis of Aglaophtyoton has been punctured (an inhabited?) by a parasite.